The postal system of Mexico dates all the way back to Aztec rule. When the Aztecs ruled over 5 million people who resided in the current-day Mexico, they maintained a postal system which consisted of messengers following well-established paths. When the Spaniards invaded and conquered the Aztecs in the early 16th century, they adopted the postal system the Aztecs already had in place. Then in the late 1580’s, the Spanish nobility ended the national system, and it would not be re-established until 1756. Despite the early establishment of the postal system, the first Mexican stamp was not released until August of 1856. The series of five stamps had a value of ½, 1, 2, 4 and 8 reals. They all carried the visage of the Mexican patriot Miguel Hidalgo, the leader of the Mexican War for Independence. Once these stamps were printed, they were sent out to district post offices. At the district post offices they were overprinted, and then they were issued to the public. The idea behind this method was to prevent theft, because many stamps that were not overprinted were stolen. This system of overprinting at district office would stay in place for at least one hundred years to help prevent theft. Following issues included the “Eagle” stamp, Emperor Maximilian I and another Hidalgo stamp. 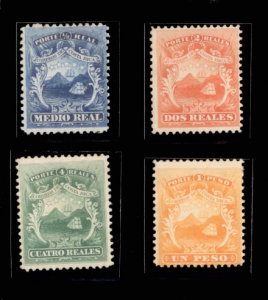 All of these featured unique overprints to show they were verified by the state, and the aesthetic of these overprints are a point of interest to those collecting Mexican stamps. If you are interested in collecting Mexican stamps or other Latin American stamps from Panama, Argentina and more please contact Treasure Coast Stamps. Brief Postal History of Mexico. APTA.